I finally found what might be the perfect black skirt for summer! and still keep the proportion right. even more than once a week, as committed. 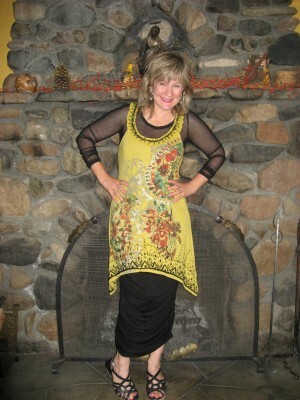 Linking with Patti @ Visible Monday @ http://notdeadyetstyle.blogspot.com/. ~ by admin_aef on May 19, 2013. My favorite pairing would be the 3rd one which in my opinion really showcasing that stunning unique skirt! We should go shopping together I want to know where you get all these fab pieces! Not very often do I wear short tops…but it does happen…and when better than with a skirt? I would LOVE to shop with you, but the truth is, I probably get at least 30% of my pieces online! Looks great on you. I agree we have to be careful about judging clothing on the hanger. Great lesson for us all about not judging a skirt by its hanger! Love these looks – thanks for sharing with VisibleMonday. This is very inspiring – it looks good with everything! A great skirt you got there! Love the different looks! Cute cute cute! 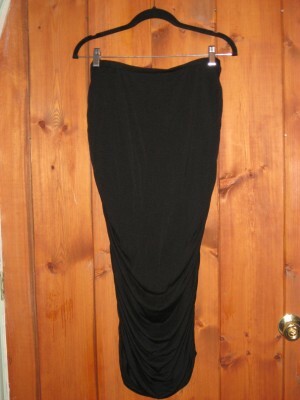 Besides the color, length, and all the ways you brilliantly wore this skirt, I want to take it right off your hanger. Great job! This skirt is clearly a wardrobe staple. I love how you’ve styled it so many different ways. You have a great eye for seeing how this thing can go from a little nothing on a hanger to WOW. I’m definitely sold on this idea! A narrow skirt is a perfect alternative to skinny pants. I’ll be trying this! A new follower! LOVE the way you are wearing this skirt with the longer tops/dresses! Great looks! What a completely original, completely perfect styling lesson! Of course it goes with everything. You look adorable in each photo. You should be well pleased with yourself, smarty pants … no, smarty skirt! I’m a big fan of ruching!